Oil on canvas, 21.25 x 15.5 inches. Tate Gallery, London. This picture is displayed on the Tate Gallery's website. Go first to the Tate's homepage. At the top of the column on the left-hand side of the page you will see "Collections" as the first item. When you open this page, you will see on the right-hand side of the page a column where the fourth item says "Search collections." When you open that page, you will find the search engine; simply enter the names of the artist and the painting. If you click on the artist's name, you will see all the works by that particular artist at the Tate Gallery. If you click on the name of the painting, you will be taken to the image. Most of these images can be enlarged by clicking on them. If the picture has a display caption, be sure to read it; the notes will supplement what I have to say about the illustrations. Pages will open in separate windows, so close them to return to Shakespeare Illustrated. The Gallery's site is nicely constructed and easy to navigate; the Tate kindly allows us to link to its pages and to see the works in its magnificent collections. Dadd was judged insane after he murdered his father in 1843, and he was committed to Bethlem Hospital. When Dr. William Hood came to the hospital as its administrator in 1852, he saw that Dadd could profitably fill his time with painting and gave him the supplies he needed. The Fairy Feller's Master-Stroke occupied the artist for nine years (1855-64), but the strange work has yet to be fully interpreted and explained. What the painting means is obscure, but the content of the picture is made somewhat comprehensible by a poem Dadd wrote to describe the various figures and activities depicted; we know from his poem, Elimination of a Picture & its subject--called The Feller's Master Stroke, that everything in the painting is intentional and that it is not simply a pastiche of mad delusions. Featly & neatly--equal without trouble. Through lovers' brains, and then they dream of love. . . .
Dadd loved Shakespeare, and many of his paintings allude, even if somewhat tenuously, to various plays. 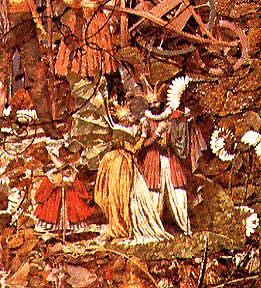 One other detail in the painting draws two characters from A Midsummer Night's Dream. Directly above the Patriarch stand Titania and Oberon (see the detail), looking down on the busy scene of the painting. These two aspects of the painting are the only ones that have their source in Shakespeare, but if you wish to pursue the painting in more detail, David Greysmith, working from the text of Dadd's poem Elimination of a Picture & its subject--called The Feller's Master Stroke , closely describes all the figures and actions in the painting (121-25). As we look through the clutter of nuts and berries, the tangle of grass and stems in the foreground of this puzzling work, we glimpse a scene that is oddly fitting for a nineteenth-century visualization of A Midsummer Night's Dream. This play was not, Richard Altick notes, ever performed in the eighteenth-century or the early part of the nineteenth as Shakespeare wrote it; instead, it had been adapted many times as a backdrop for opera and spectacle. The Reinhardt film looks as if the director went directly to painters like Dadd and Paton for the designs of his scenery, and the misshapen gnomes of The Fairy Feller's Master-Stroke take their place in a twentieth-century motion picture. The Feller is the centre of attention of the many characters in the composition, most of whom are, in one way or another, distinctly disturbing and malicious: the hard-faced, huge-calved ballerinas, the insect-like figure just above the Feller, and especially the little old man with a white beard, looking on with crazed concentration and appalled terror (plate 64).